CPU : AMD 6300 Hexa-Core 3.6 GHz. GPU : AMD R9 380 4Gio VRAM. OS : Debian Testing 64 Bit. AMD Graphics Driver : Mesa 18.3.4 - Open-GL 4.5. So if anyone knows how to fix that I will be glad to give a test to the grass shader. Thank by advance for any response ! Is the Overlay shader enabled just to check? I dont think its enough to just put the shader setting at highest, you need to choose custom and set it manually. I have just tried that, but it is not working. I compiled by hand FGFS, so is it possible that a build-time option for the grass was missing ? Can you show your rendering options? There is no build time option for grass. Are you in a location where there is a grass overlay defined? I don't think that's done everywhere, and the airport keep looks unusually bland to me even without the geometry shader overlay. Could you please give me a place where you are sure the shader is present. I tested it at LFNC (screenshots), it does not work. 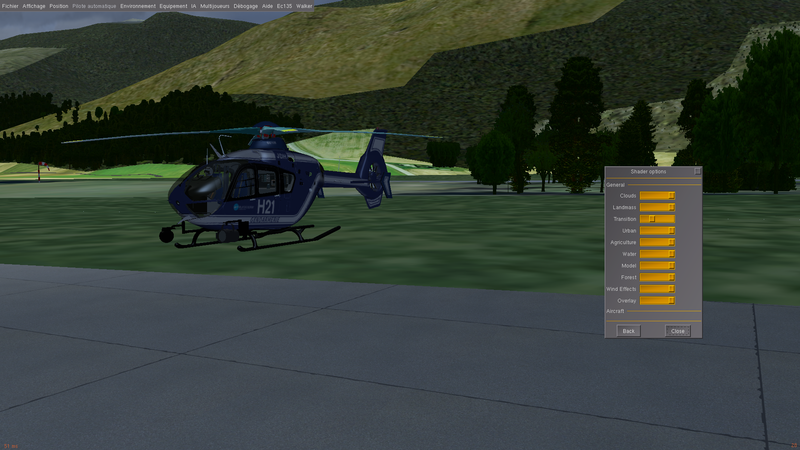 But I just tested on the same airfield but on another PC with a GeForce 750 Ti, and the grass is here. So I really think this is driver related. It would seem to look that way. Any shader-related errors in the console/log file (you might bump up the log level to 'warn' to see them)? That would be the clearest sign. I understand the solution we're using to run this with the OpenGL version FG is generally using is a bit hacky, and so the driver doesn't play along with it. Is there anything I can do on my side or should I wait for another driver or another release of FGFS ? I'm... not really sure whether there's something you can do. My understanding (which could be incomplete) is that geometry shaders aren't really supported by the OpenGL version used by FG. OpenGL has gone many versions since, but bumping up version FG-side would require a vast amount of rendering code changes, so it likely won't happen. Many drivers still work fine with the geometry shaders and just do it 'anyway' despite the standard saying otherwise, but if the driver doesn't, by now it likely means it's intentionally not added and the driver is performing precisely to standard and not making allowances (geometry shaders aren't a new bit of technology, so all drivers today sure can do them with the right OpenGL version). So I fear neither driver update nor FG update won't change the situation in the short and mid term - in the long term I don't know what'll happen to FG rendering. (There's a remote possibility that inside the effect file you can somehow declare a different extension which makes the driver process the shader anyway, but I have no idea what that might be, this is really special knowledge that'd be required). OSG uses OpenGL 2.1 and supports modern OpenGL via extensions, i.e. OSG isn't designed to completely ignore the fixed function pipeline and only use GL >3.0 core features. Geometry shaders are a core feature since GL 3.2, so we have to settle with using an extension to support geometry shaders in FlightGear. Extensions, unlike core features, don't have to be available. Every graphics card vendor and driver programmer is free to implement them or not. So yeah, nothing you can do on your side, and nothing we can do on our side. OSG is kind of limiting in that regard.